One of my favourite places for a Sunday stroll and somewhere I never tire of photographing. 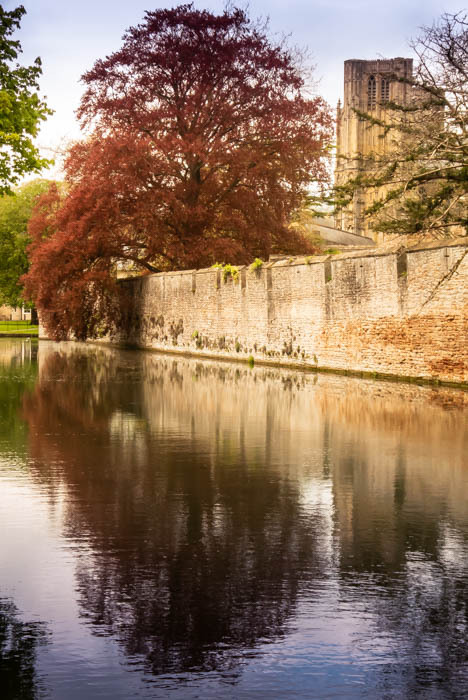 This is Wells in Somerset – the moat surrounding the Bishop’s Palace, next to Wells Cathedral. Seem to recall reading once that the moat, added to the palace in the 14th century, was less to do with deterring invaders than having the latest ‘must have’ architectural accessory. Everyone who was anyone had to have a moat, apparently. Though elsewhere I have also read that the Bishop who had it built had a less than comfortable relationship with locals, due to the taxes he took from them, so there may have been a practical need for the moat as well. This, complete with the still-existing drawbridge and portcullis, constitute pretty serious security measures. Whatever the case, it suits visitors and swans to have this now tranquil bead of water in the centre of this old city.